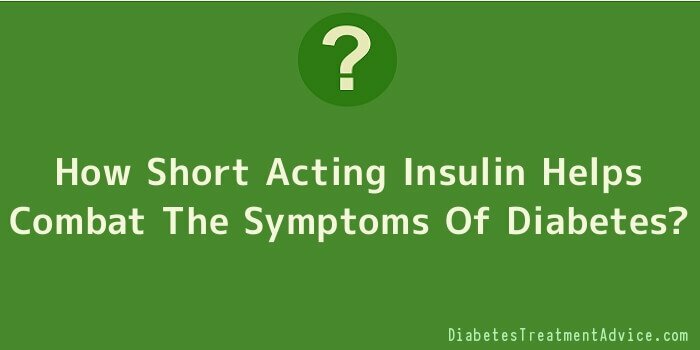 Short acting insulin is a means to assisting individuals with diabetes in maintaining a normal level of blood glucose. Insulin is the key to regulating metabolism of carbohydrates in the body. Individuals with type 1 diabetes have no production of insulin; therefore, they need to receive their insulin from an outside source. The greatest risk of high blood glucose levels is during mealtime. Individuals with type 1 diabetes typically use fast acting insulin, but it can be combined in some cases with long lasting or intermediate insulin. Individuals with type 2 diabetes can combine the use of fast acting insulin with certain medications. There are many fast acting insulin products on the market, giving an individual with type 1 diabetes many options for use. Lispro-fast acting insulin (hormone) that generally takes about 15 minutes to begin its process, but it peaks between a periods of 30 to 90 minutes after injection. Lispro was developed as the first insulin analog. It is most effective if taken prior to meals, when a shorter duration of action is necessary. Also known as rapid acting insulin, the onset of Lispro can be two to three times faster than other short acting insulin products. Apidra- rapid acting insulin (hormone) is one of the newer options available to patients who have diabetes. The onset of Apidra is very similar to Lispro; it can be taken 15 minutes prior to eating or 15 to 20 minutes after eating, depending on the needs. Apidra is available in cartridges for use in a pen or can be used with a pump. Humalog-short acting insulin has an onset about 15 minutes after injection. It normally takes about an hour after injecting it to peak and it will last for about three hours. As with other fast acting insulin, Humalog will begin working during the time when blood sugar levels rise, effectively reducing the problems of high blood glucose and complications relating to it. It is difficult to determine the best short acting insulin because each individual’s body and condition of the disease will be different. The complications and effects will vary. One may work better than the other, and with different combinations of other insulin and medications. One particular other fast acting insulin that is worth mentioning is Novolog. Many people who have a problem with Humalog may want to try this. It basically has the same onset time, peak time and reduction time, but it just seems to work better with certain individuals. It is highly recommended that anyone who has diabetes receive a check-up or examination at least twice per year, if not more. Problems with insulin or combinations can occur at any period of time for many different reasons. Adjustments to lifestyle, among certain conditions that arise because of injections, will cause variances with certain treatment plans. These complications can create short and long term health issues if not treated (hypoglycaemia, high blood pressure, numbness due to circulation, etc.). A personal treatment plan that may include short acting insulin combined with daily exercise and a coordinated meal plan is the best way to combat the symptoms of diabetes. It will also create an independence from the disease, so the conditions don’t control your life.